Micro parts are increasingly common where the requirement is to manufacture miniaturized and sometimes complex geometries in the submillimeter range. Some of the parts which can be fabricated using these processes include among others connector pins, miniature screws, microgears, microshafts. The increasing demand for powerful miniaturized products for all industrial applications has prompted the industry to develop new and innovative manufacturing processes to fabricate miniature parts. One of the major challenges facing the industry is the dynamic market which requires continuous improvements in design and fabrication techniques. This means providing products with complex features while sustaining high functionality. Micro parts are defined as parts that have at least two dimensions in the submillimeter range. Microforming is a manufacturing process to produce miniature parts for various engineering applications. The parts manufactured by the microforming technology are commonly used in everyday life, such as consumer electronics, mobile phone, and etc. . Also, the microforming technology is receiving increasing interest from micro system technology (MST) or medical sectors. Although some of the parts are currently being produced by microforming technology, but still now the major numbers of these parts are produced using conventional manufacturing process. For small quantities conventional process may be applicable, if asked for large quantities, microforming technology seems to be appropriated due to its well known advantages. Microforming, as one of the micro manufactiring processes, provides a promising approach to fabricating metallic microparts, such as connector pin, miniature screw, microgear, microshaft, chip lead frame, and IC-socket. Figure 1 shows some microparts and the parts with microfeatures made by microforming processes. In microforming, the material deformation behavior is different from that in macroforming. It is generally difficult to predict and control the microscale material deformation behavior due to the small size of deformed parts. 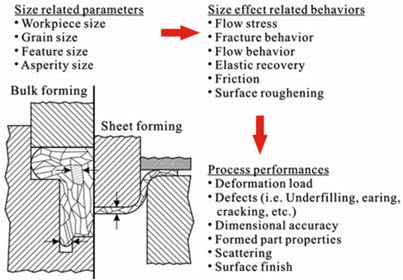 In this process, there are four interactive factors affecting the material deformation, namely tooling-workpiece interface condition, as shown in Figure 2. In addition, they further affect the performance of microforming system and the quality of the microformed parts in terms of deformation load, stability of the forming system (scatter of process variables), defect formation, dimensional accuracy, mechanical properties and surface finish of the formed microparts. Furthermore, the realization of microforming processes in laboratories is different from that in mass production . Product quality and productivity are two major concerns in the latter. Good product quality and high productivity can be achieved with a properly designed process chain.